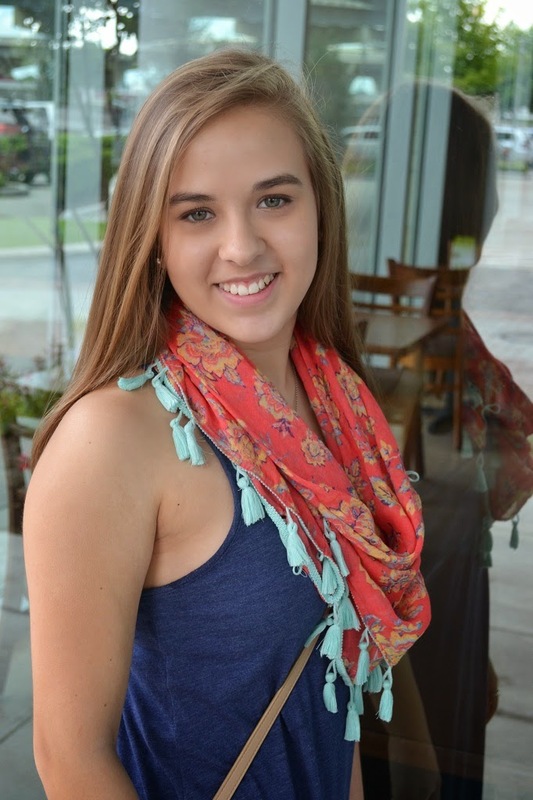 Kelly Lyons is a sophomore at Seven Lakes High School in Katy and a keen dancer. At 11 years old, she was diagnosed with Crohn’s disease – an auto-immune disease which causes inflammation of the digestive tract. Since then, Kelly has been determined to face her health challenges head-on, and to use to her leadership skills and inspiring story to raise money for Crohn’s research and to extend awareness of the issues which make life so challenging for those suffering from this debilitating disease. 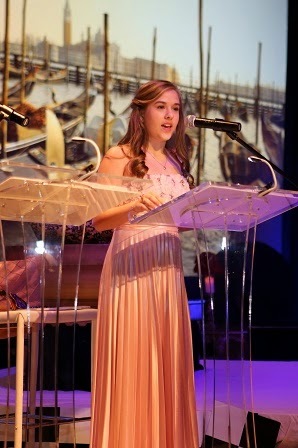 She founded her Lucky 15 project in 2012 to raise funds for the Crohn’s and Colitis Foundation of America, and in 2014 she became CCFA’s Youth Ambassador. She also serves on the Children’s Patient Advisory Council of Memorial Hermann Hospital. I'm 16 and a sophomore at Seven Lakes High School. I've always been really interested in school and I always enjoy learning about something different. I've always naturally fallen into a leadership role and though I knew that is what I wanted to do later in life, I wasn't sure how I would come across a leadership role that would really fit with what I wanted to do. When I was in sixth grade, I was diagnosed with Crohn's disease, which is an autoimmune disease. How it affects you is a little different for everybody, depending on where the inflammation in your digestive tract occurs. I have it in my stomach and in my intestines, and it prevents me from absorbing nutrition. When I was diagnosed, I only weighed about 50 pounds and I wasn't eating anything because everything hurt when I was digesting it. That meant I wasn't gaining any weight. The doctor told me it was like having mosquito bites on your arm that you just keeping rubbing, except that it was happening inside me as food was trying to pass through. I started on three months of steroids to get me back to a place where I could absorb nutrition. I am now on one of the newer biologics, Remicade, which I've been on for four years now. I found out great news in December, my Crohn’s is in remission. Unfortunately, I will need to keep up with treatments to keep it there, and those come at the expense of my immune system. At the start of the year, I spent two weeks with pneumonia because Remicade suppresses the immune system. This means that for about four weeks of every eight, I basically have no immunity to infection. I can still go to school but I try not to sit next to people that might be coming down with something, and we always stand up at the doctor’s office. Crohn’s was the first diagnosis that I had, but it was simply the beginning of a long list of other things to follow. I also have dysautonomia and intracranial hypertension. It's hard to point the finger at which condition causes what symptom, but definitely the intense fatigue makes it harder to get up at six and go to bed at ten, and have to do it all over again every day of the week. Unfortunately, this year, I have had to miss several months of school because I couldn’t stay healthy enough, but I am feeling stronger now and am catching up so that I can return in March. Sixth grade was hard for me, and during seventh grade, I had to be homeschooled for almost the whole year. Because I wasn't able to attend much, school became more precious to me. I started to realize how precious so many things that I took for granted things are. That was when I decided that if I wanted to accept this new life, and also make it less intimidating on a day-to-day basis, I had to find a way to make a positive impact, to find something that would change my life for the better. That summer, when we were visiting my grandmother in Denver, she let me spend time in her craft room which is full of jewelry-making equipment – beads and wire etc. By the end of the summer, my mom and I were making everything we could think of, cute homemade pieces that my friends and I might wear. That is how I started Lucky 15 as a way of raising funds and awareness at the same time. At first, Lucky 15 was only going to be jewelry, but it has developed further since then. I was very lucky to be given support by Dr. Medrano, the principal at my middle school, Seven Lakes Junior High. When I went to see her, she immediately asked how the school could get involved. So I worked with my counselor and the principal to promote Lucky 15 within the school. We did pep rallies and spirit nights, we made T-shirts and I sold my jewelry at a holiday booth in December. 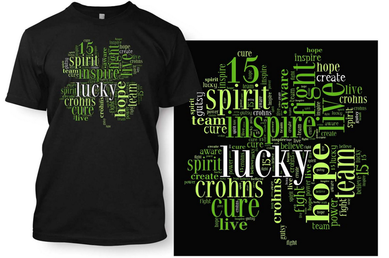 All the money that we’ve raised so far through Lucky 15 has gone to the Crohn's and Colitis Foundation of America, the CCFA, for medical research, educational and support programs, and for Camp Oasis. In our first year, we raised about $4,000 which was way past what I was ever expecting, and so far we have raised more than $15,000. Why Lucky 15? 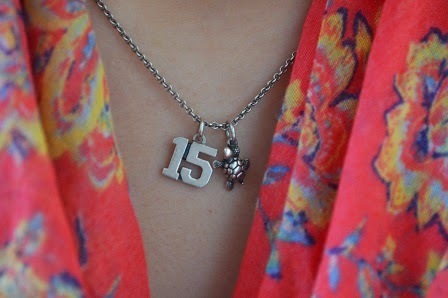 Well, fifteen is my favorite number and I wear a necklace with a 15 on it. It also has a turtle to represent us each taking one step at a time. Plus, I like green, so of course the color green had to be in it somehow too. I also like to ask people to think of fifteen things or people or places or times that they are thankful for. When you're struggling or having a hard time, it is helpful to be able to go back to that list. Focusing on the good things really helped me through the first couple of years after being diagnosed. I was grateful that the people who were there at the beginning really believed in the project. When they saw that it was really important to me, the project became special to them as well. I was fortunate that my junior high and my high school are close. Some of my supporters and their parents helped me continue Lucky 15 at the high school too. It was so cool to watch it develop even further. Lucky 15 has not just been about raising money to go towards finding a cure. It is also about educating people. As I started talking to people, I was surprised to hear a lot of, "I have a friend with Crohn's disease." I have even met other kids who have been diagnosed who were in the same primary school I went to. I am so grateful that I could share my story because knowing that there was someone out there who had the same challenges as I did has allowed us to become friends and it's opened up doors too. After my first year of running Lucky 15, I started making connections with the walk manager and the executive director of The Crohn's and Colitis Foundation of America in Houston. They asked me to be the youth ambassador for their Winter Ball. That was such a cool experience. I had the opportunity to give a speech to a ballroom full of people. Luckily, because of the stage lighting, when you're up there you can only really see about twenty people so you feel like you're only talking to them. In fact, it was a lot easier than presenting some of my projects to my high school class. After my speech, I got to talk to some of the guests. Of course, I didn't really know who they are, but we had really interesting conversations and it was lovely to meet them. It was only after some guests had walked away that someone asked me if I had been nervous talking to them. It turns out that they were actually really important, one was the head of a major company! That evening was such an amazing experience and it really gave me the confidence to share my story because people wanted to listen. I spoke again at the Houston Walk for CCFA – they called me their Future Hero – and that speech was to about 1,000 people at Discovery Green. Those two events taught me that I love public speaking and made me more confident as a leader. Looking to the future, I thought I might try to be an architect but since I have had the opportunity to be on the Patient Children's Advisory Council at Memorial Hermann Hospital, my eyes have been opened to some professions in the hospital. They interest me because I know how it feels on the other side of things as a patient. Of course, I don't know if I'm going to be healthy enough to go off to college right away. We've talked about it, and though I’m not sure yet what I want to do, I think it will be something where I can use my patient experiences because they give me insight about how to make the patient experience better for others. Lately I have come to understand that I am passionate about making things better for other hospital patients. What is your Houston story, or your Greater Houston story, since you live in Katy? I was born in Houston but moved to Covington in Louisiana as a baby. Then when I was about nine, my dad got a job here in Houston again and we moved back. Although I enjoyed my time in Louisiana, I always felt that Houston was much more like home. Although I live in Katy, I have had quite a lot of experience in Houston because I'm here all the time for doctors’ appointments and medical test and treatments. The CCFA office is here too. I have I connected with Houston as a place that has meaning to me and I am grateful to be here because the medical resources are tremendous..
That would have to be my mother, Lisa. We were always close, but when I was homeschooled in seventh grade, she was my school and I spent all my time with her. We would drive to doctors’ appointments or we were at home with each other, so we really became very close and almost like one unit. We would even finish each other sentences. Watching her accept the changes that my diagnosis made to our lives has guided me toward my acceptance of it as well. She approaches everything with determination and perseverance, and maintains a desire for it to be done right. That has really inspired me to find something close to my heart and to go after it. My mom also understands that I have to find balance. Even though I love my schoolwork and going to school, she knows I can't spend all my time on schoolwork, even if I've missed a day. She knows too that even though I love dance, I can't make dance my only priority. She has also taught me that I can't always be thinking about my health, only focusing on whether I'm sick or on the medications I have to take. She encourages me to find that balance for myself, and make the right choices, even though they are some of the hardest decisions to make. I think that's one of the biggest gifts that she could have given me. And how do you find, or seek to find, that balance in your life? It is definitely a day-to-day thing. I have to ask, what will I feel glad to have accomplished at the end of the hour? Sometimes it's at the end of the week, but sometimes it really is just at the end of each hour. What am I going to be able to do in the next hour that is going to make me make me satisfied and happy with today? What advice would you give to someone facing a diagnosis of Crohn’s disease? First, I think that you really have to move in your own time. My GI nurse, Sara Hughes, really helped me when I was first diagnosed. She said, “Here's the website, here is CCFA, and here is a bunch of other resources. When you're ready to go and learn about other people and accept this, you can look into it further. You don't have to do it right now, just when you are ready.” That was one of the best things for me. She didn’t just tell me that I had this challenge and that I had to just move on with my life. Also, I would say that you have to find and keep that personal connection to whatever it is that you want to do. Make sure you nurture that passion. Don’t let go of everything that was important to you before, even if it doesn't quite fit into your life now. Evaluate what you want to do. You need to make your own decisions and you need to do it in your own time. I think it's so great to be in a place where there are people from all over, all with so many different goals and passions and interests. That is one of the reasons why I love my high school, which has close to 4,000 students. I love that everybody is just doing whatever they think is going to make them happy in the future. But at the same time, you cannot help but find people with common interests and goals. If it isn’t the dance studio, then it must be my high school, Seven Lakes. It surprises even me to say that, but I find that I am always striving to get back to school, especially after I've been home sick for a week, like now, when I’m home for weeks and weeks. I just want to be back there. Even though I end up with a lot of work, I am so glad to get back to school and into a community where I can just enjoy the ordinary stresses of being a sophomore. It will be good for me to get back to normality. Outback Steakhouse! Having Crohn's disease, not everything sits quite right with me. I want to spend time with my friends and family, but it's not always easy to go out to eat with them. I've always managed to find something at Outback Steakhouse that works for me though. There are some pretty standard things I have to avoid, and that varies from person to person, but one of the universal things is spicy foods. For me personally, it is things with a lot of yeast like cinnamon rolls, or peppermint, which is rather strange. I also can't to drink a lot of milk products. It all depends on where the disease is in your body. This must be the Adamson Ballet School in Katy. 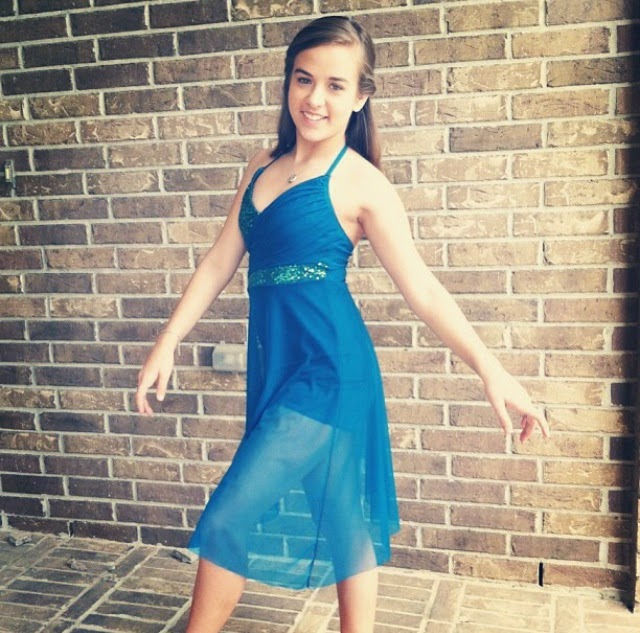 I've danced for 13 years now and dance has always been something very close to my heart. I mostly do ballet but I've also done tap and jazz, and other styles within jazz too, but ballet is usually the style I come back to and spend the most time and energy with. Dance is so controlled and so disciplined, you always know what to expect, even when you're doing something new. It's a very calculated form of exercise and it keeps me healthy in other ways. I know it keeps me from just wanting to sleep on those hard days. Adamson Ballet School has become almost a second home to me. Everyone is so encouraging and supportive as I pursue dance even while having these medical challenges. Lately, I’ve had to accept that I cannot go to class regularly. When I’m sick, dancing can be hard, but having people there who don't look at me as if I'm crazy for trying is wonderful. I'd have to say the weather. The dysautonomia that I suffer is really impacted by the heat. The heat causes all the blood in my body to go down to my feet and it just sits there. I take medication that makes my body feels like it's cold in order to push the blood back up. So the heat is not my friend, and Texas is totally the wrong place to live! But then, the cold isn't very good for Crohn's disease either, so there are limitations to what I can do outside. I am always grateful that I picked dance because it’s an indoor activity. I pleaded with my mom to take me to dance when I was three and I don't know if that was fate, but the the fact that I picked something which would not require me to run in the heat is perfect. I could not cope with that at all. Who would be your own Inspiring Houston Woman? I was her office aid for a whole year, so I really got to know her on a personal level, and she also worked with me on creating Lucky 15. It was really good for me to see that even though she has Crohn’s disease, Ms Porter has a family and children,that she’s been to college and has a job that she really likes. Her mom connected with us too which helped my mom, because she could relate another mother whose daughter had grown up with Crohn's disease. To have a counselor that knows exactly what you're going through was just crazy, but fantastic. For more information about Lucky 15, visit Kelly’s website. For more information about the Crohn’s and Colitis Foundation of America in South Texas, visit the Foundation’s website. Dear Kelly, Even though I have not met you your article made me feel as though I know you. I greatly admire your courage and positive upbeat attitude and I'll be keeping in touch with all that your're doing through your grandmother Glenda. You Go Girl!